Chocolate has great potential to be used creatively when making desserts, both in terms of presentation and flavour. Tempering chocolate creates beautifully shiny chocolate that can be formed and set into exciting and appealing shapes, creating a professional finish to any dessert. It can be tricky to work with, as tempering chocolate involves carefully raising and lowering the temperature of the chocolate, but is well worth it for the crisp, shiny finish. This method sets out how to shape tempered chocolate into cylinders, but don’t be scared to experiment with other shapes. 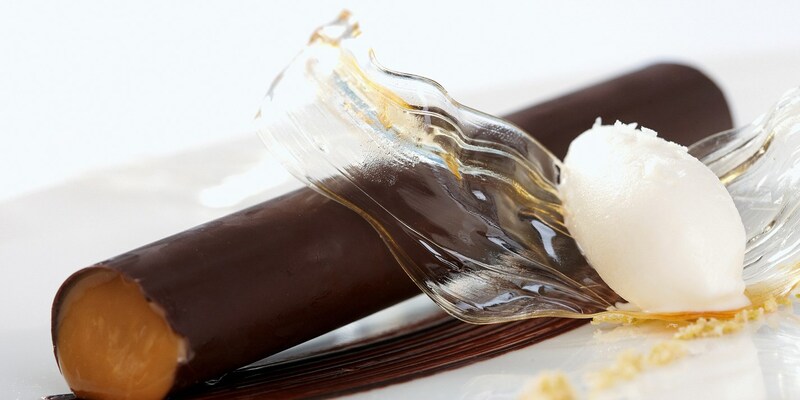 Chocolate cylinders are frequently filled with ingredients such as chocolate mousse, caramel mousse or, for something a little different, banana and caramel parfait. If you want to fill the chocolate cylinders, make sure the chocolate is completely hard and set before filling, and don’t remove the acetate in step 6 as this will help give more support to the chocolate.